Makin' it in Memphis: Wordles. 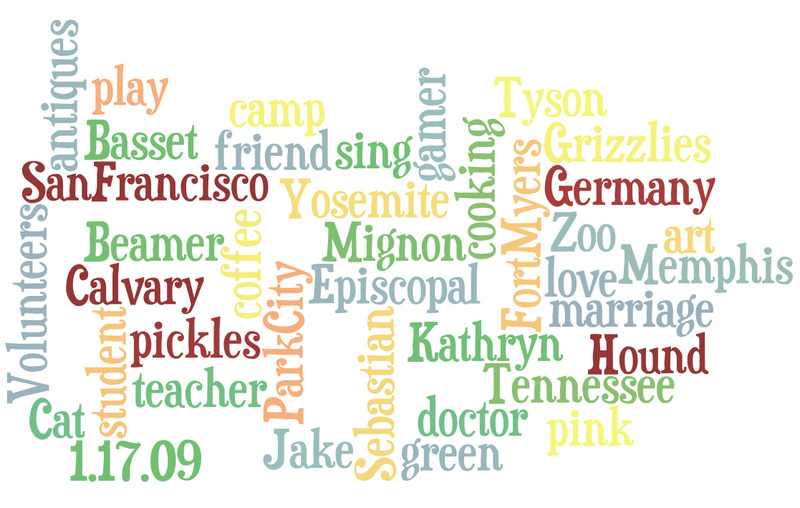 So a blog I read talked about Wordles, which is a free website where you can create these word art things. He referenced it as a teaching tool (and I might totally use that!) but in the meantime, I'm using it as a free item of decor. 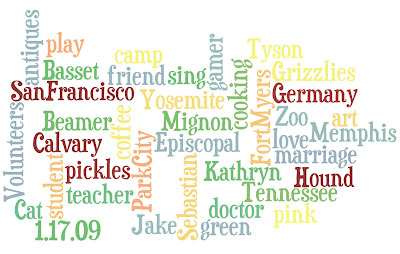 I made one using words that relate to Jake and me and I'm going to frame it and put it somewhere in the house. I wanted to share because this would be such a good idea for a present for someone who is getting married, having a baby, moving to a new place.. the options are endless! And the site is super easy to use. If you click on the picture below, it will link to mine so you can check it out. You're welcome to steal my idea! There are tons of fonts and you can do your own color palette - mine is based on the colors in my house. you're killing me...what's going on with your kitchen?